Last minute opposition from auto dealerships who were inadequately engaged by VTA. The belief by some Council members that improved north/south transit service within Sunnyvale is a higher priority than improved transit on El Camino Real (despite the fact that current and projected demand does not warrant such an investment at this time). Insufficient information on potential traffic impacts for some Council members (an Environmental Impact Report has yet to be conducted to determine project impacts and the tradeoffs between dedicated lane and mixed flow alignments). Since the Sunnyvale vote, VTA staff have changed their recommendation from over ten miles of bus only lanes to three miles of bus lanes with a mixed-flow alignment for the rest of the 17.3 mile corridor. On September 21st 2012, the VTA Board of Directors will be asked for guidance on whether to proceed with the El Camino BRT project and if so, how. There is much at stake on September 21st. The 22 and 522 bus routes that run along the El Camino Real carry one fifth of VTA’s bus riders and transport more people per mile than VTA’s light rail system. Despite their productivity, existing bus service is totally inadequate to handle the 66,000 new jobs and 112,000 new residents projected by ABAG to move within walking distance of El Camino Real by 2035. Making minimal improvements to transit service while planning for substantial growth is like putting a bandage on a broken leg when what’s really needed is a cast. VTA projects a 35% increase in vehicle miles traveled (VMT) and a doubling of time stuck in traffic on El Camino Real without BRT over the next twenty years. Today’s traffic congestion along El Camino Real will pale in comparison to what will come if we do not invest in world-class rapid transit. Stimulate the economy and create jobs: BRT on El Camino Real will attract tens of millions of dollars in federal funding and create hundreds of local jobs. BRT will also provide a foundation for sustainable development, including supporting local plans for new jobs and homes near transit. More efficiently use taxpayer resources: BRT costs five to ten times less per mile to build than light rail and 40% less to operate and maintain. BRT will also improve VTA’s farebox recovery ratio, meaning that a lower percentage of VTA’s operating costs will be paid for by taxpayers thanks to increased ridership and faster transit travel times. Provide economic benefits for households: BRT will provide reliable access to jobs, shops, services, and other needs for all people. In addition, by offering a competitive alternative to private vehicles, household transportation costs can be reduced drastically, thereby freeing up resources for other needs such as housing and healthcare. Improve public safety and create safer streets: Bike lanes, upgraded crosswalks, and sidewalk extensions can be incorporated in areas with dedicated bus lanes to reduce traffic injuries and fatalities. Increased lighting, fare inspectors, and security cameras at stations will create a greater sense of safety of waiting for the bus, and emergency vehicles can access dedicated bus lanes, resulting in improved response times. Foster healthy and sustainable communities: High quality public transit and more complete streets encourage walking and biking, thereby lowering cardiovascular disease. As more people take advantage of BRT with its state-of-the-art hybrid vehicles, we’ll reduce our dependence on fossil fuels, help tackle climate change and improve the air we breathe. Continue planning for the best possible project on El Camino Real. Transformative projects often take many years to plan and to gain consensus, and sometimes political realities and community needs do not lend themselves to artificial timelines. As such, VTA should not close the door for cities to adopt dedicated lanes as more information comes to light over the course of the planning process. In particular, VTA should study both a mixed flow and dedicated lane alternative in the project’s Environmental Impact Report (EIR) so that decision makers will have more information to base their opinions on in the future. 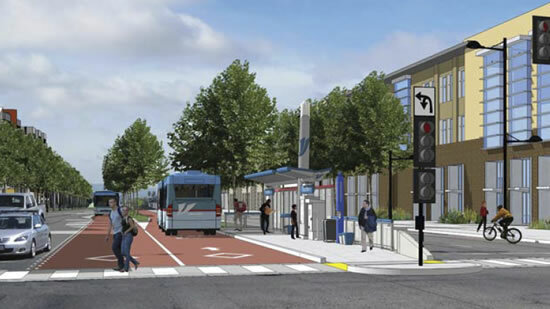 Reward the City of Santa Clara for their Council’s unanimous support of multimodal BRT by ensuring that Santa Clara receives funding for dedicated bus lanes, bike lanes, and pedestrian amenities. We believe Santa Clara will serve as a model for the region and inspire other cities to support true BRT. More effectively engage local elected officials, city staff, residents, and the business community. VTA staff must work with key stakeholders such as auto dealerships to inform, answer questions, and incorporate concerns and needs into the BRT plans. We are encouraged by VTA’s Draft Public Participation Plan and expect staff to utilize this new resource. Together we can create world-class public transportation in Silicon Valley and the Bay Area. Take action to ensure that well planned BRT along El Camino Real moves forward. Attend the September 21st VTA Board of Directors Workshop at 9am at the County Government Center. Read the Board packet prior to attending the meeting. Call or email the VTA Board of Directors. Email can be sent to board.secretary@vta.org. For more information or to help make BRT a reality for El Camino Real contact Chris Lepe at clepe@transformca.org or call the TransForm Silicon Valley Office at (408) 406-8074.